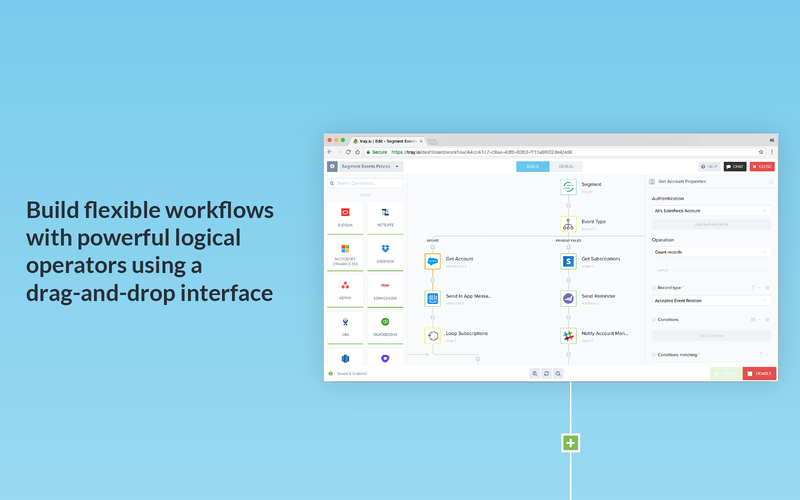 Process Improvement: Replace mundane tasks and processes by building time-saving automated workflowsPowerful workflows you can create with Tray + SlackTeam communication: Instantly notify teams by channel with key deal information whenever deal stages change.Aggregate customer data: Set Slack alerts whenever customers submit tickets. 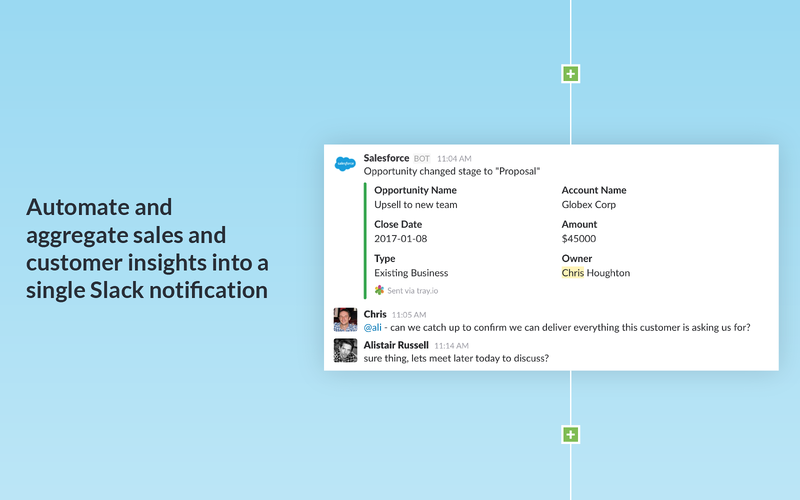 Integrate messaging apps, such as Intercom or Drift to pick up customer inputs, with product usage data from apps like FullStory, to compile all previous customer touch points. 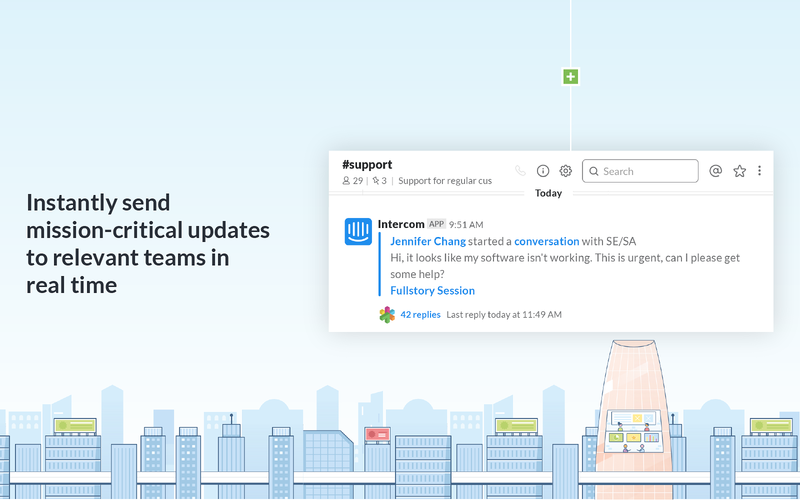 Then complete the integration with Slack to send real-time messages to your #support channel with a full picture of the customer’s current issue, previous issues, and account history. 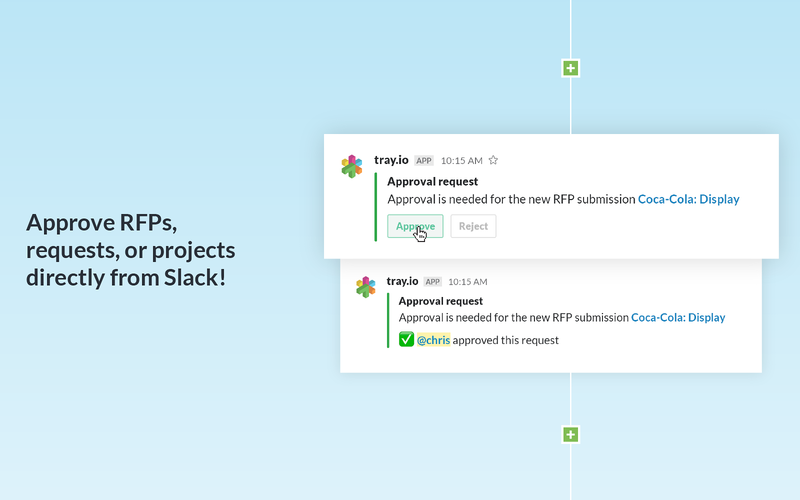 Empower your support team to directly reply to interactive support requests via Slack message, and append records and sync back to the rest of your stack to keep all customer interactions fully logged.Automate daily / weekly / monthly updates: Regularly pipe sales dashboard (e.g. Salesforce) or marketing performance reports (e.g. 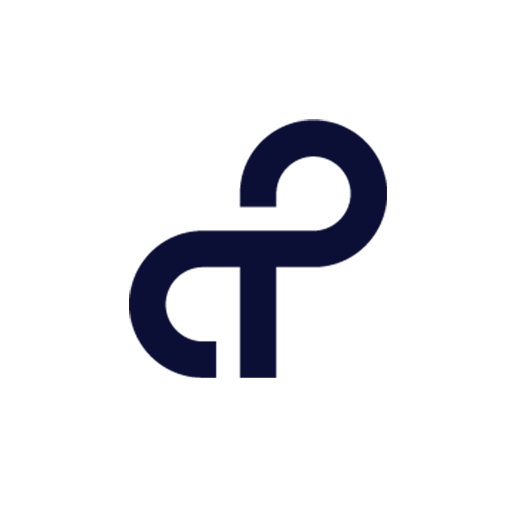 Google Analytics) to relevant team channels.Optimize approval processes: Incorporate the approval function into your Slack instance and automatically trigger the creation of a project in your project management apps, such as Asana or Jira, and/or in your CRM. Expedite approval for such processes as lead routing based on information provided by leads; gathering product feedback; and contract- and invoice-related processes as well.Route notifications intelligently based on logic: With large teams spread across multiple territories and subfunctions, route notifications intelligently to the right teams and individuals with the Tray Platform’s powerful and easy-to-use logical operators. tray.io will be able to send messages to your workspace. tray.io will be able to access basic information about your public channels (including names, topics, purposes, creation date, and latest message). tray.io will be able to access basic information about your private channels (including names, topics, purposes, creation date, and latest message). tray.io will be able to modify information about your public channels, including name and purpose, as well as archive and create new ones. tray.io will be able to modify information about your private channels, including name and purpose, as well as archive and create new ones. tray.io will be able to post to specific channels in Slack. tray.io will be able to access your workspace’s Do Not Disturb settings, including each workspace member’s schedule, who is currently snoozing notifications, and when all Do Not Disturb sessions are scheduled to expire. tray.io will be able to modify your Do Not Disturb settings, including your schedule, whether you are snoozing notifications, and when your Do Not Disturb sessions are scheduled to expire. tray.io will be able to access the names and images of custom emoji on your workspace. tray.io will be able to access basic information about your direct messages (including names, topics, purposes, and creation date). tray.io will be able to modify the unread status of your direct messages. tray.io will be able to view URLs to provide previews and other functionality. tray.io will be able to change information about your group messages as well as create new ones. tray.io will be able to access basic information about your group messages (including names, topics, purposes, and creation date). tray.io will be able to access pinned items on your workspace along with associated messages, files (including content and information such as who uploaded it, when it was uploaded, and sharing history), and who pined the item. tray.io will be able to add and remove pinned messages and files. tray.io will be able to add and remove emoji reactions from messages and files, on your behalf. tray.io will be able to access your reminders and reminders you created for other workspace members. tray.io will be able to add reminders and remove or complete reminders available to you for individual workspace members. tray.io will be able to access your starred items, along with associated messages and files (including contents and information such as who uploaded the file, when it was uploaded, and sharing history), and who starred them. tray.io will be able to add or remove stars from messages and files, on your behalf. tray.io will be able to access information about your workspace, including name, email domain, and icon. tray.io will be able to access the names, descriptions, and members of your workspace’s User Groups. tray.io will be able to change information about your User Groups (including name and description), as well as disable and create new User Groups. tray.io will be able to access your profile fields, as well as any data you’ve entered in them. tray.io will be able to modify your profile fields, as well as any data you entered in them. tray.io will be able to view the email addresses of your Slack workspace’s members. tray.io will be able to modify your profile information. tray.io will be able to add link previews for messages containing URLs. tray.io will be able to send messages on your behalf to your workspace. tray.io will be able to access profile information for all users on your workspace, including names and contact information. tray.io will be able to view administrative information about your workspace including access logs. tray.io will be able to access any messages and activity you can see in public channels. tray.io will be able to access content of files created inside of or uploaded to Slack (including information such as who uploaded the files, when they were uploaded, associated comments, and sharing history). tray.io will be able to upload files, as well as add, edit, and delete file comments on your behalf. tray.io will be able to access any messages and activity you can see in private channels. tray.io will be able to access any messages and activity you can see in direct messages. tray.io will be able to access any message history and activity you can see in group messages. tray.io will be able to access emoji reactions on your workspace along with associated messages, files (including contents and information such as who uploaded it, when it was uploaded, and sharing history), and who added the 'reaction'. tray.io will be able to search all messages and files that you can see on your workspace.